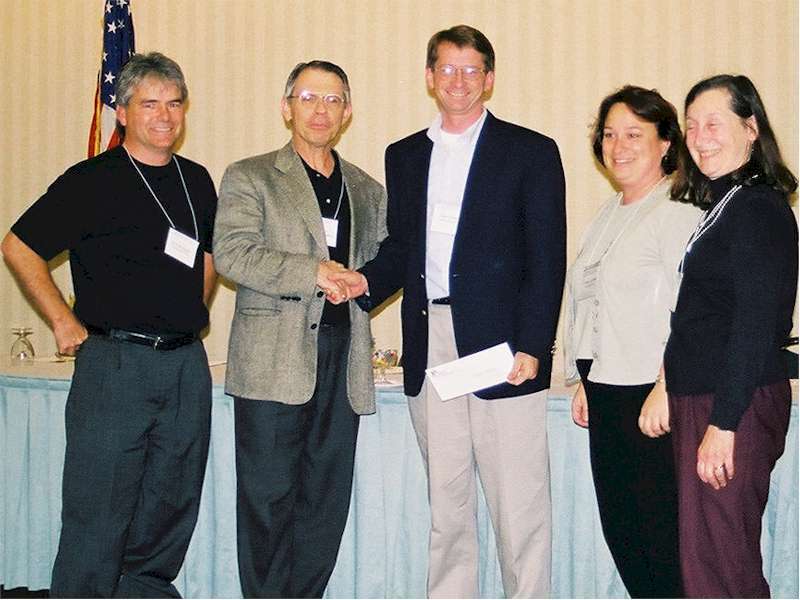 ExxonMobil Foundation President Ed Ahnert presenting check to Humboldt State University team members John McGuire, Dale Oliver, Valerie Gardner, and Phyllis Chinn. Washington, D.C.—The Department of Mathematics at Humboldt State University has received a $3,000 innovation grant from the ExxonMobil Foundation to improve the mathematics education of teachers. Project personnel for the grant are: Dale Oliver, chair of the Department, Phyllis Chinn, also of the Department of Mathematics, Valerie Gardner, Eureka City School District, and John McGuire, Pacific Union School District. The ExxonMobil Foundation is offering a total of twelve grants nationwide in support of the belief that the mathematics community can lead the way in providing good models for building the kinds of cooperative efforts needed for long-term improvement of teacher education. The grant, announced at the recent National Summit on the Mathematical Education of Teachers, will allow the Humboldt State Math Department and the Redwood Area Mathematics Project (RAMP) to enhance their collaborative efforts to prepare and professionally enhance teachers of mathematics. At the core of the project is the development of a model for RAMP Teacher participation in the mathematical preparation for prospective teachers. Such participation will provide motivation for prospective teachers to learn school mathematics deeply and provide additional development for experienced teachers to articulate the link between a teachers’ understanding of mathematics and student learning. Funds from the planning grant will support the participation of four classroom teachers in the project, as well as support the efforts of math faculty and RAMP personnel to seek funding for broader implementation of this effort. Pre-service teachers learn important mathematics, but often miss opportunities to see the mathematical ideas and problems that arise naturally in the practice of teaching. RAMP teachers learn important methodology in mathematics, but often miss opportunities to share their knowledge and improve their profession. The goal of this project is to begin development of a model of interaction between prospective teachers and RAMP teachers that provides for such missed opportunities in a way that fits well with the math courses offered by the Math Department and the professional development courses offered by RAMP. Humboldt State University prepares between 100 and 125 elementary teachers per year, and an additional 10 – 15 secondary math teachers (about half of whom do student teaching in the area) per year. The Redwood Area Math Project provides professional development to a core of 25 – 30 teacher leaders per year, with an additional 75 – 100 teachers receiving at least a week of intensive professional development.